Chesterfield boss Martin Allen said defender Jerome Binnom-Williams would learn from his crucial red card at Barrow in midweek. Binnom-Williams was given a game-changing red card early in the second half as Chesterfield’s unbeaten start to the National League season was ended by a 3-2 defeat at Barrow. The Spireites were 2-1 up when Binnom-Williams was dismissed seven minutes into the second period for a rash tackle. 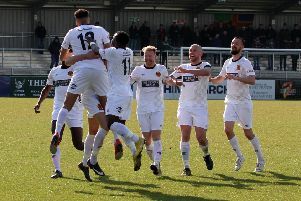 Allen later said it was the correct decision as Barrow hit back to win 3-2 — and the defender is suspended from Saturday’s clash at fellow promotion favourites Salford City. Talking on Thursday, Allen said: “I have had a chat with him after he came and knocked on my door. I didn’t have to call him in, he came to see me. “He is very upset and disappointed. “You couldn’t meet a nicer bloke. He has trained hard and has been doing extra work over and above what we do. He is hard-working, dedicated and a good person in the dressing room — a good person to have around. “I think all the supporters have taken to him. He hasn’t played great apart from the Wigan game. “But in those other games they have seen 110% commitment from him. Everyone I know loves that. The 23-year-old defender, who made 23 appearances last season, is a former England Under-18 and Under-19 international. Allen added: “Every day is a valuable learning experience for all of us, me included. All of us have got so much to learn. “So hopefully we are all looking to make ourselves better.